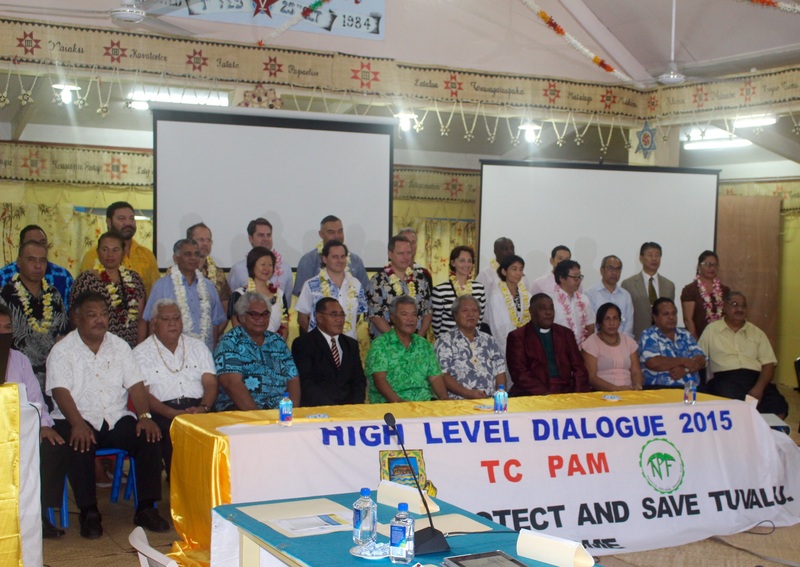 Last night we were invited to the opening reception of the “High Level Dialogue on the Tropical Cyclone Pam Recovery & Vulnerability Reduction Plan.” Representatives of the “donor partner countries” were being hosted by Tuvalu, to share about the effects of last March’s cyclone, and of course it was a forum for asking for additional assistance. Representatives/delegations were here from Australia, New Zealand, Japan, Taiwan, India, the E.U., the United States, plus representatives of various United Nations agencies, the World Bank, and I’m sure there were others. We arrived soaking wet from a downpour that began just as we got into the dinghy. I felt rather out of place. But we got to chat with the Prime Minister again, and we had a very informative chat with his wife. She explained that there was an extremely high “king tide” a decade or so ago, that flooded many areas, and raised the salt water level under the ground. 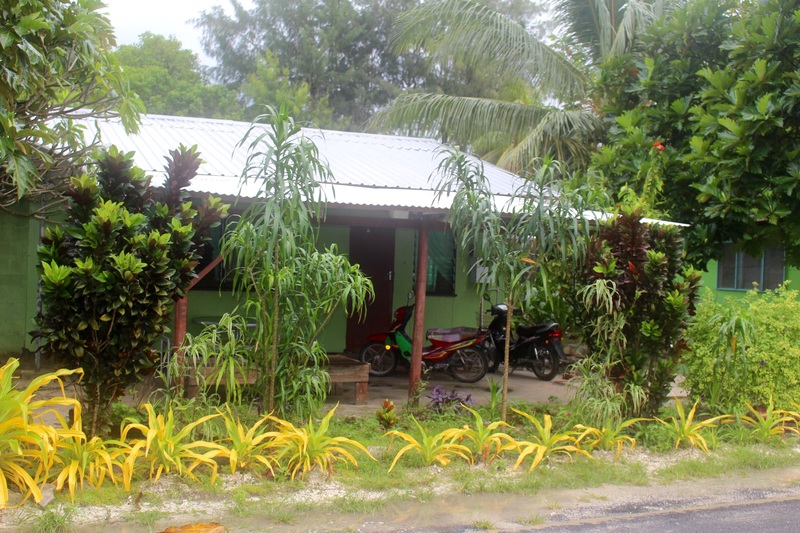 Coconut and banana trees, which have shallow roots, survived; but the breadfruit trees died. Now breadfruit trees are growing again; they have planted them in raised beds. She also spoke about traditional handicrafts. 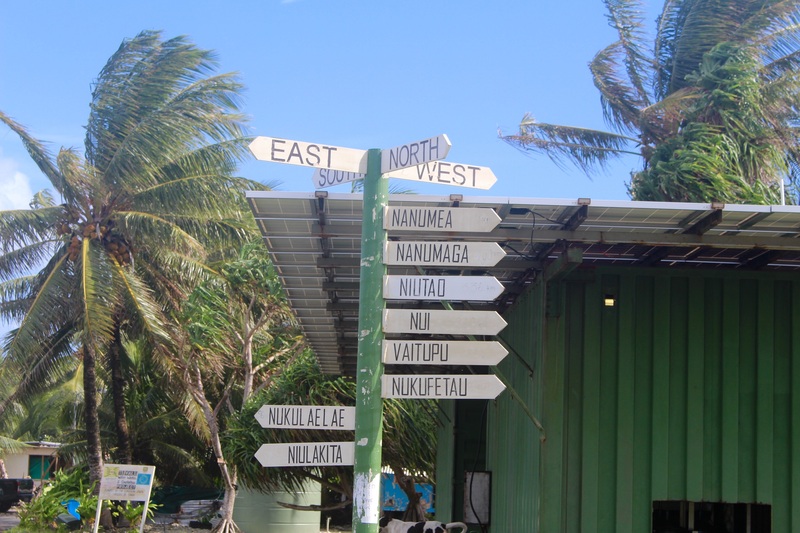 Unlike most Pacific islands, there are none for sale here. She explained that traditionally the handicraft skills were kept within a family, and passed from mother to daughter. But now most girls are busy with school, and many go off to study abroad. The elder women will not teach the skills to girls other than their daughters, and their daughters are busy, absent, or not interested. The skills/crafts are dying out. So she is championing an effort to invite the elders with the skills to come together and teach girls, beyond the family boundary. Hopefully having her support behind this effort will lead to acceptance of this new way. Immediate disaster recovery aid, medium term goals, long term goals. Sea walls are wanted. Storm proof buildings. 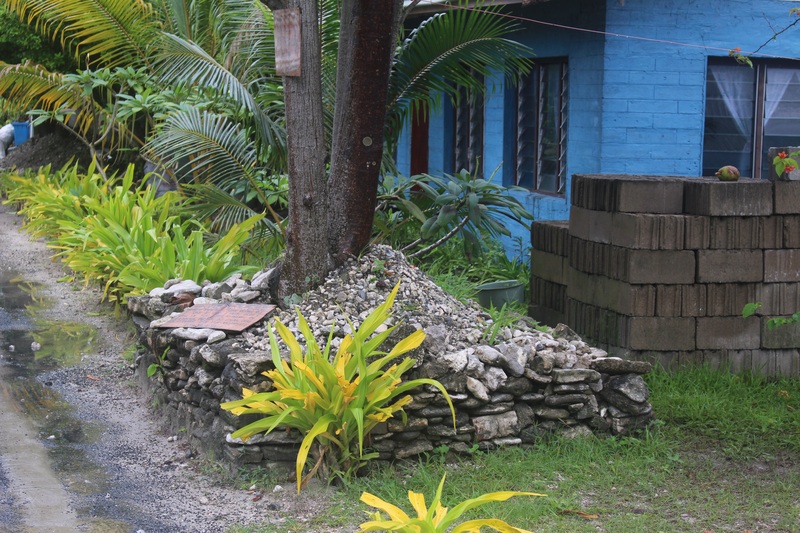 Safer access to outlying islands in storm conditions. 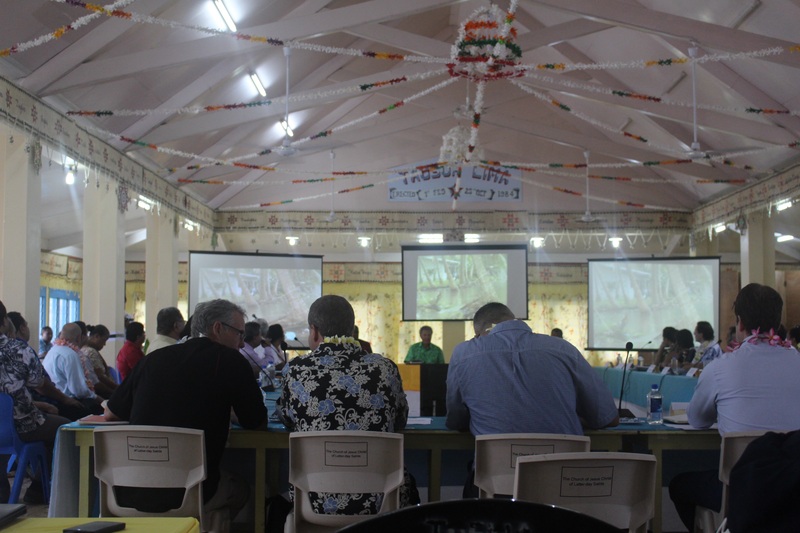 Training for local tribal leaders, who will have to take the lead in emergencies when communications with the main island/government are out. Questions about how to handle the loss of a family’s land — not property damage, but their land washing away. Should they be compensated? There is no legislation covering that situation presently. When there was a break in the rain I stepped out, as we were planning to leave for Vanuatu today. But I had a weather powwow with Bill — not about the windy/rainy weather here, but about the low pressure system forming near Vanuatu. 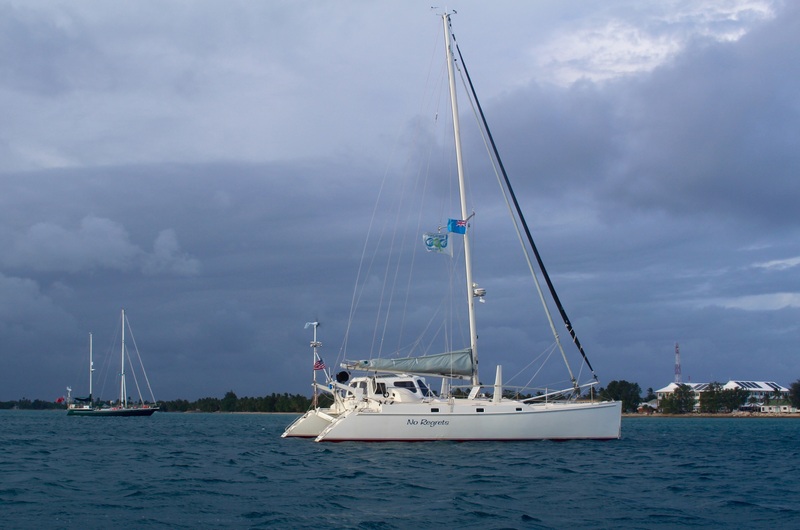 When we leave here there is no other reasonable place to go, and we could be sailing right into a tropical depression. The forecast looks like it is better if we wait a day, if you believe forecasts five days out… We decided to stay put until tomorrow and take another look at the forecast in the morning. Meanwhile Doina succeeded in doing her presentation to the PM, in front of all the High Levelers. 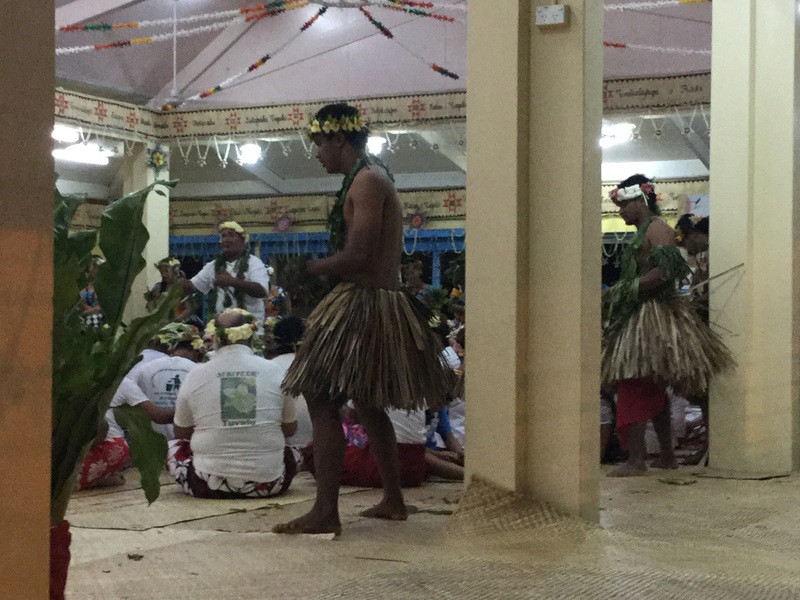 And this evening we all attended the traditional singing and dancing being done in their honor. Now THAT was worth staying for! 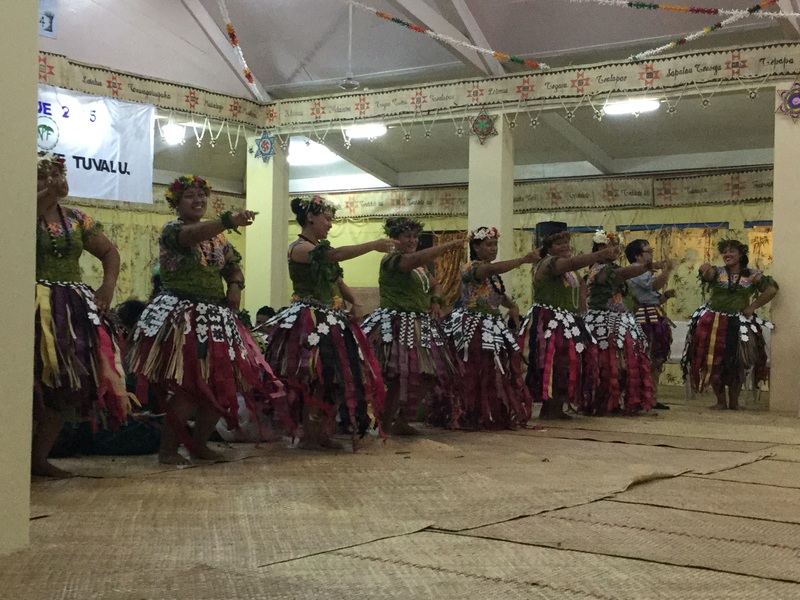 There were groups from two islands performing, and it was set up almost like a competition — one group at one end of the hall, the second group at the other end, and they would take turns performing. The styles were similar. A relatively simple song/dance would start, almost as if it were spontaneous. At the end of a short song, they would act as though they were done, briefly, and then take it up again one key higher and with more intensity. This would repeat until you thought they must be done, but it would start again with a fever pitch. The voices were beautiful, the drumming was powerful, the dancing was elegant. They have a custom here — if you appreciate the singing/dancing you walk up to the performers and spray them with perfume! The PM’s wife led the charge of sprayers. Also others were welcome to join the line of dancers. Some of the cabinet ministers seemed to have allegiances to one island or the other, and they would dance with them. The PM also. And some of the foreign delegates would join the dance, notwithstanding that they didn’t know the moves. How cool is that!? The energy grew and grew, and then they were done. 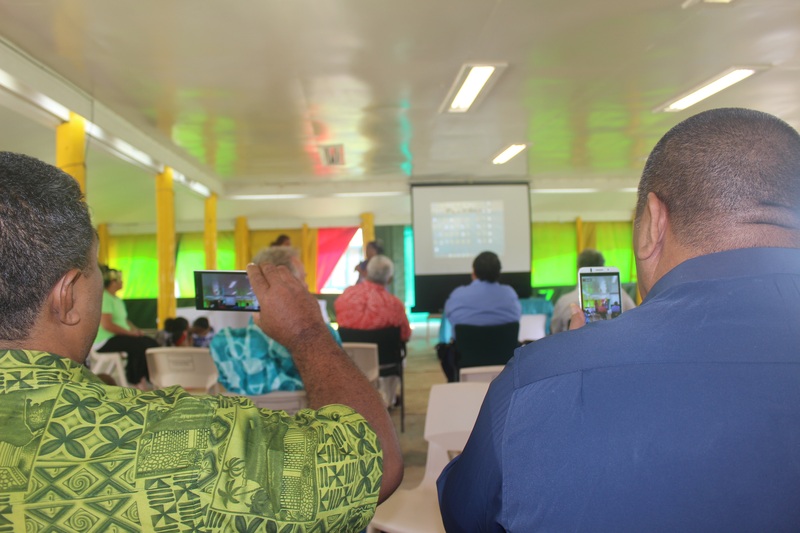 The deputy PM got up and said, “Some ask why we want to remain in our Tuvalu homeland. THIS is why! We want to be able to dance for you.” I was choked up by this. I get it that if (when?) these people become “climate change refugees” their culture will rapidly erode. If the world chips in with funding for sea walls that make these islands habitable for another couple of generations, is that worth the cost? Facing this conundrum directly, with the people’s voices still echoing inside, could break your heart. Raised bed for breadfruit tree, to keep roots above the salinated water table. Where the action was today. As you know it is nearly impossible to upload video. I did manage to upload a short clip that can give you a flavor of the dancing, though it does not convey the ever increasing energy in the hall! The crowd seated on the floor to the left behind the dancers are the singers and drummers. Thanks to all who posted comments about climate change. It’s not too late — would love to hear more thoughts and opinions. In the background are Drina and the government offices building. Note solar panels on building. Doina and Dan (and Bob) see their local friend off at the airport. 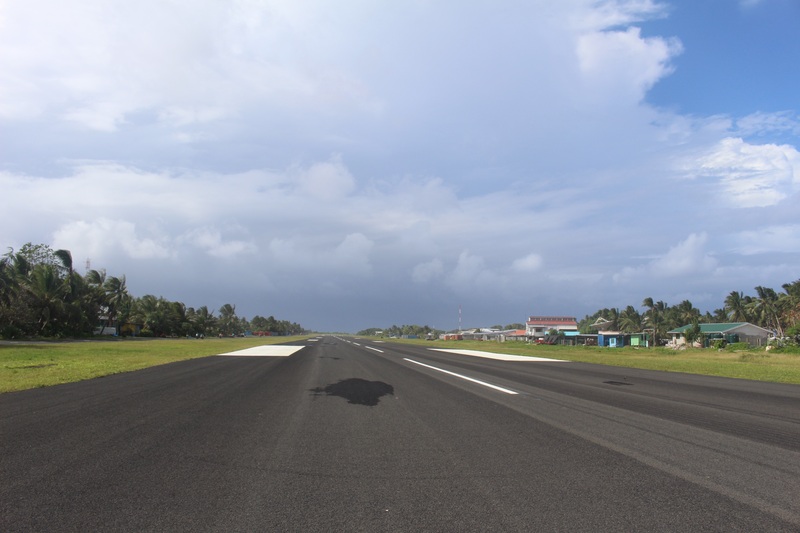 The runway was built by American troops during World War II. 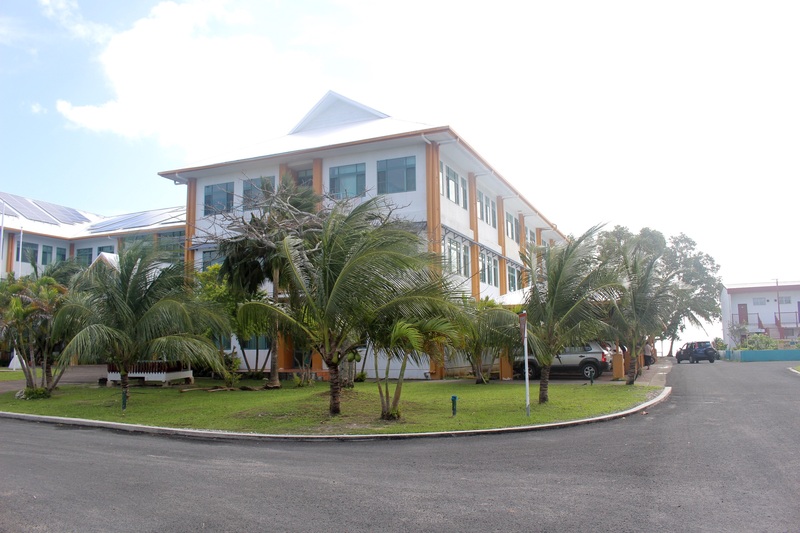 It is vital to the country, but unfortunately it occupies a large portion of the best land on the atoll, and other land was dug up for construction material. 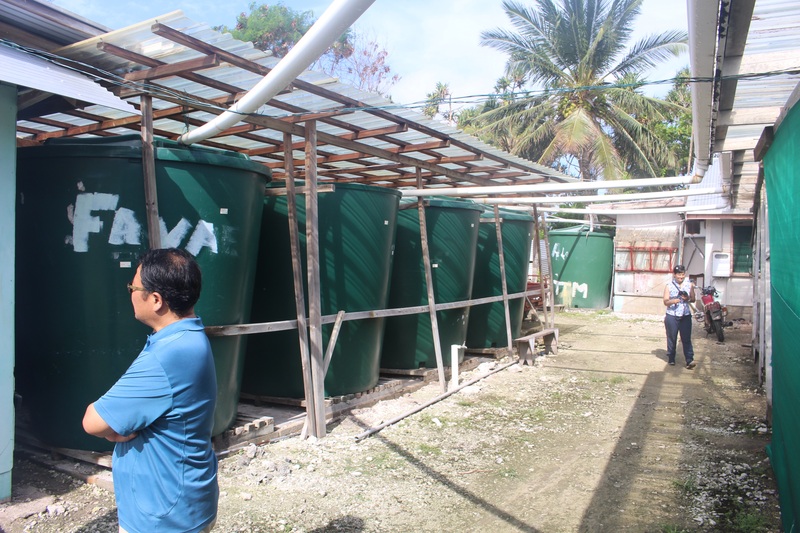 There is a project now to dredge sand from the lagoon and use it to fill the areas dug up. This is a Taiwanese foreign aid project. 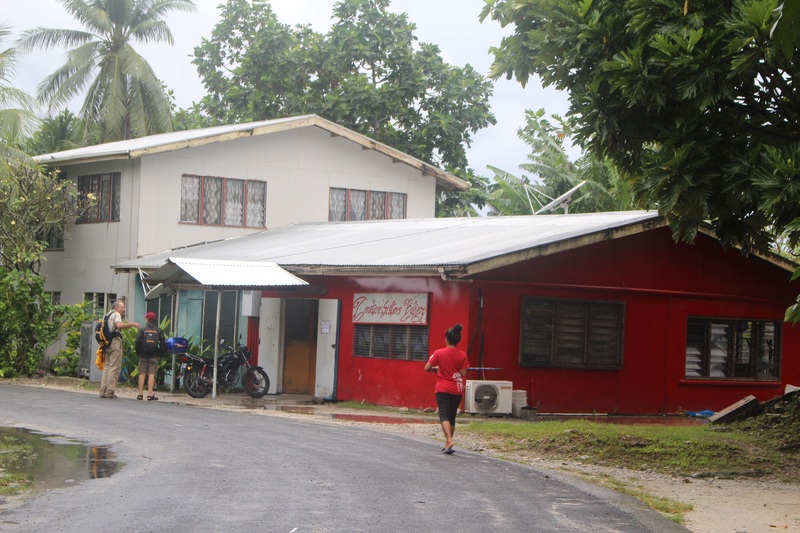 Rainwater is caught from the roof (as is done throughout Tuvalu) and used to grow foods in plots isolated from the salt-contaminated ground water. The foods are non-traditional for the island, like Chinese cabbage, but people queue up to buy the produce, and they can see how to grow it themselves. Note that the “roof” behind the sign is actually another array of solar panels. 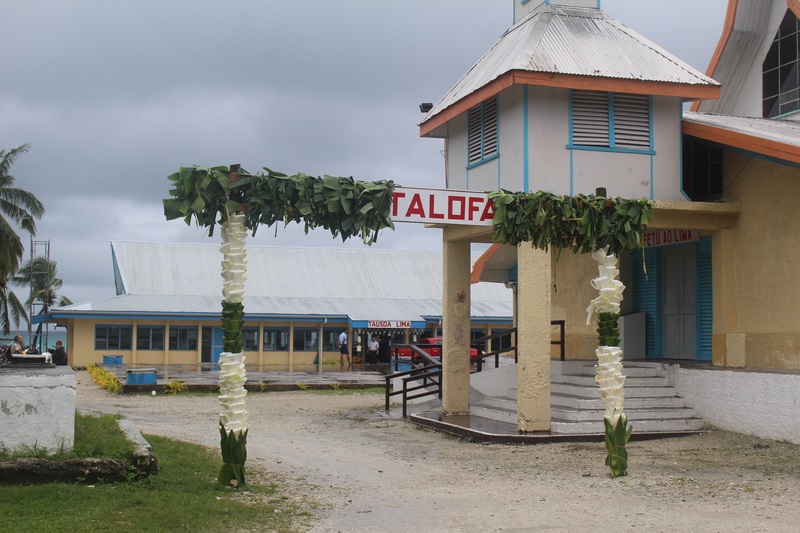 Tuvalu has a goal of producing all electrical power via solar by 2020. I doubt they will achieve this on schedule, but clearly they are trying to do their part regarding global climate change. 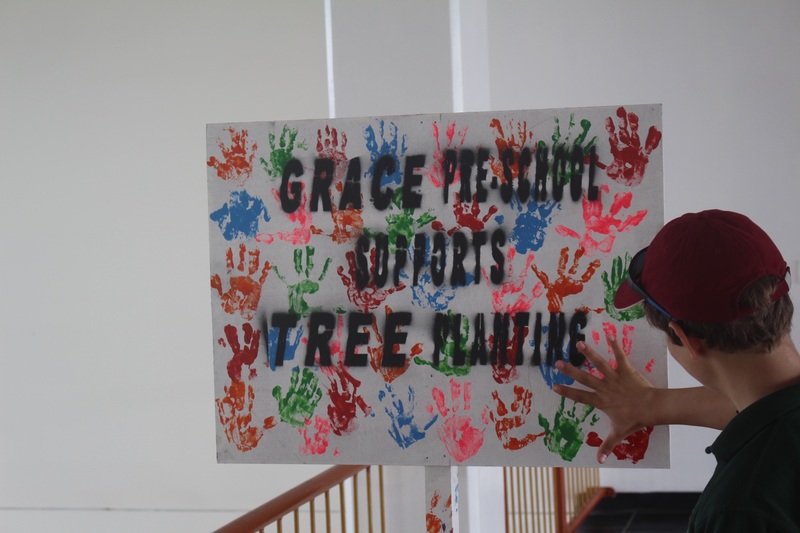 Dan also supports tree planting. 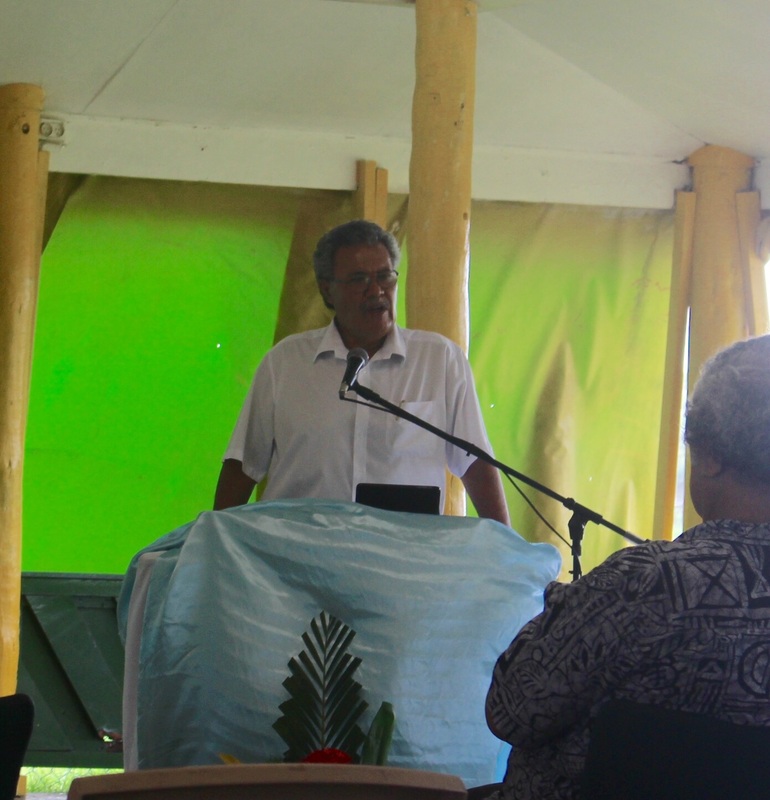 Prime Minister Enele Sopoaga speaking about the UN conference on anti-corruption. Family members recording the action on their smart phones, of course. Doina chats with the PM at the tea break. Dance break before the next presentation. I think the US Congress should do this! Bob has a new friend. Check out these cool sailboats made from an aluminum can. This regatta has a clear (and VERY fast) winner! 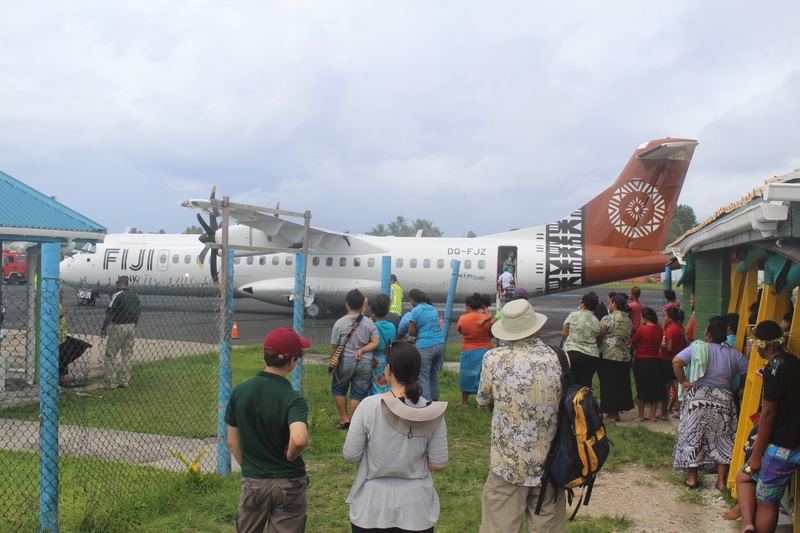 No, this one has nothing to do with Tuvalu. 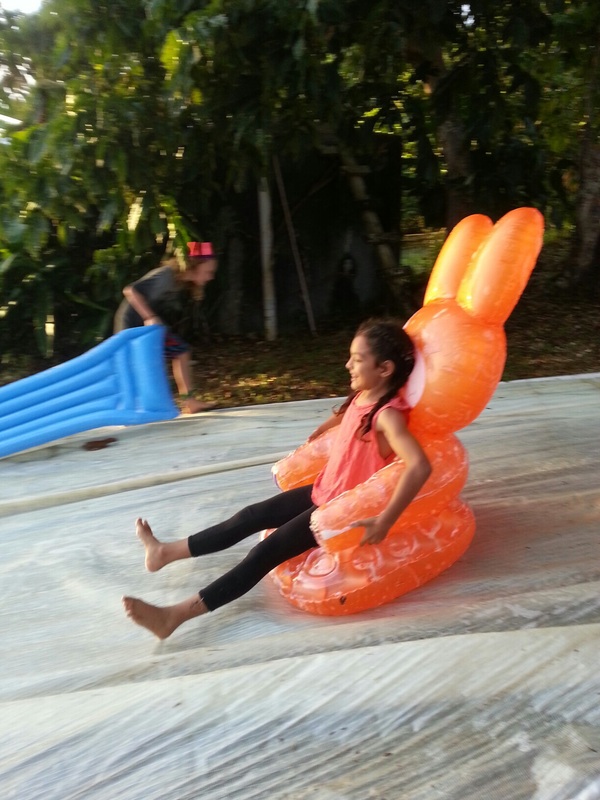 It is our old screecher sail being put to good use at a birthday party! No Regrets just visible under the trees. 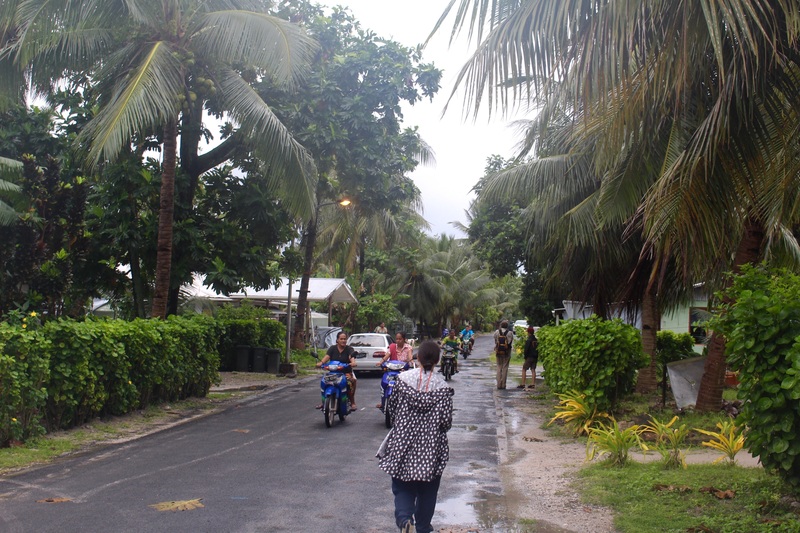 The car is a rarity; scooters are the way to travel on an atoll. 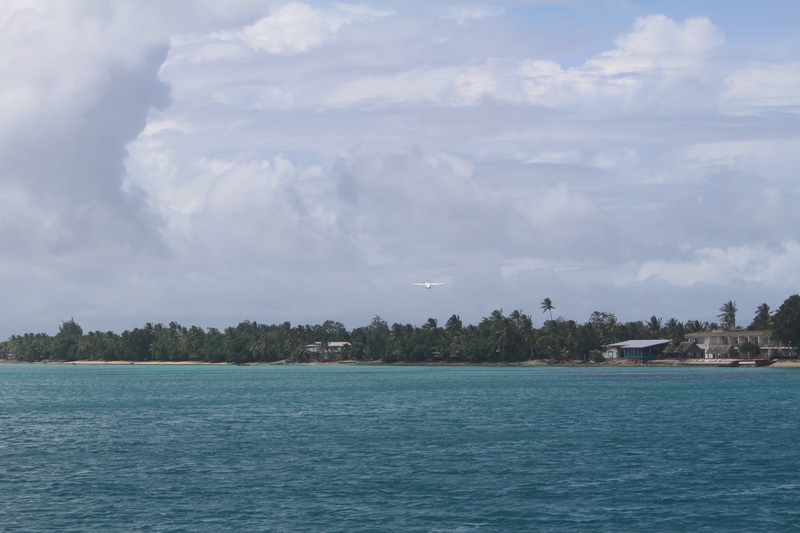 It’s hard to photograph scenery at an atoll, since it is all flat. Here’s the plane taking off — three flights a week. “No,” says Doina, “Could you arrange for us to do that?” Wow, she’s good at this! We come away with a tentative meeting, to be confirmed the next day. 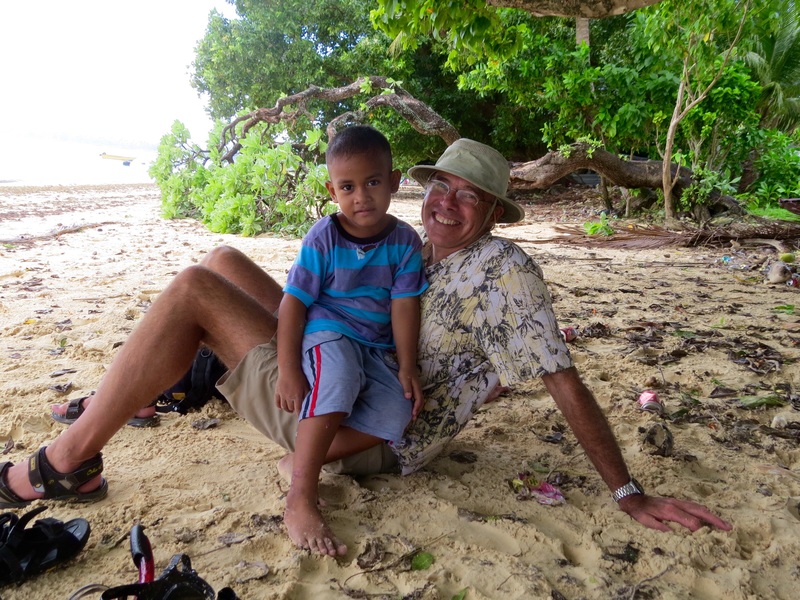 When Bob and I take Doina ashore the next morning, we are met at the dinghy dock by a messenger. “The Prime Minister would like you to attend the workshop today.” No, the messenger doesn’t know anything about the workshop, only that he was to invite the people on the yachts. With no idea what to expect, we go to the same pavilion where families were watching loved ones board the airplane yesterday. It is now filled with chairs. 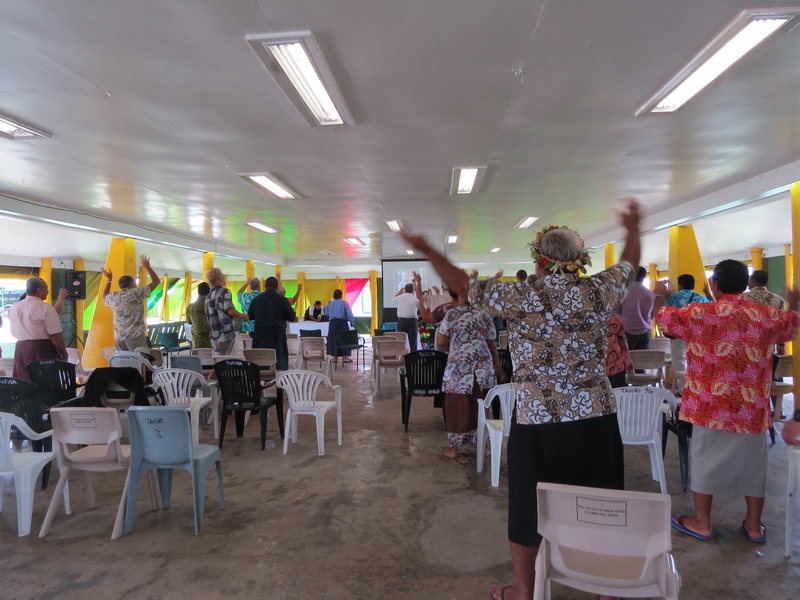 The chairs (with lettering on the back saying they were supplied by the Mormon Church) seem to be absurdly far apart…until you factor in the size of many Tuvaluans… We are told that the PM is going to sign the accord for the United Nations Conference Against Corruption. The spirit of the United Nations Conference Against Corruption is “Do the right thing. 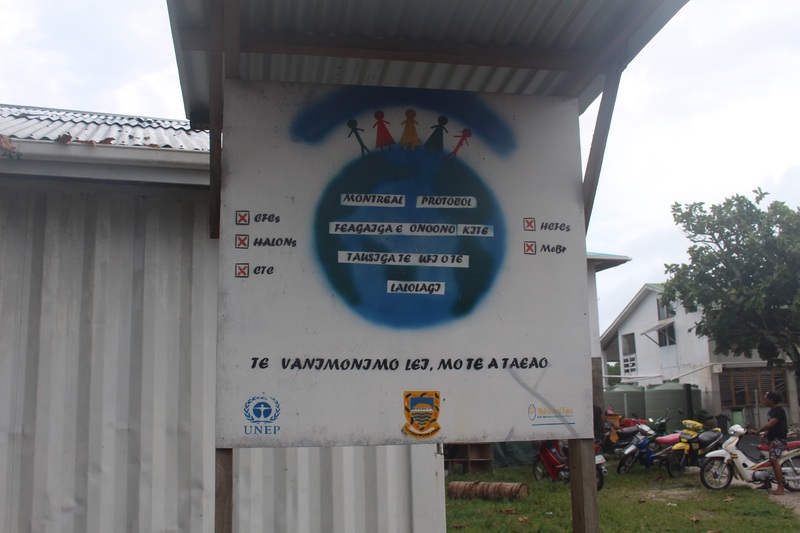 And do things the right way.” Tuvalu is doing the right thing, in the right way, and we are happy to sign the accord. 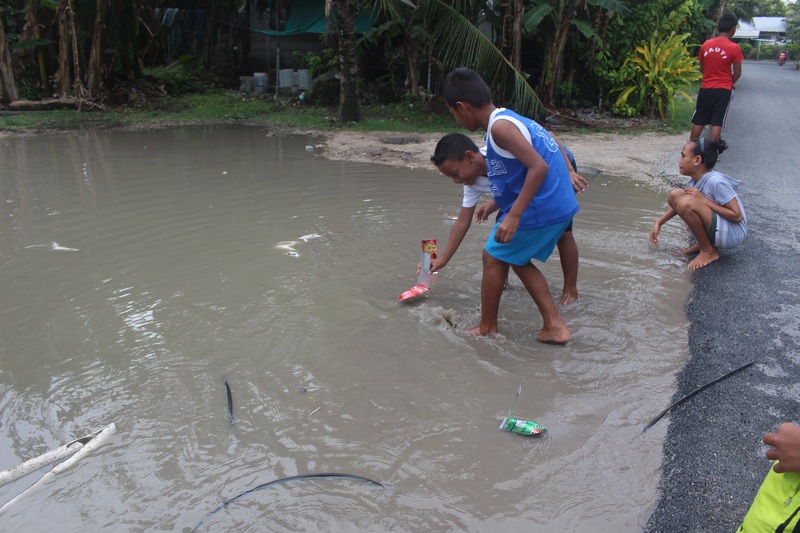 However, we must also call attention to the problems facing Tuvalu. Tropical cyclones are our biggest threat. We have “development partners” who offer to help us. But these agencies are not democratized. They are controlled by powerful governments and commercial interests. The World Bank must be reformed. The Agency for International Development must be reformed. The development partners think of their efforts as charity. 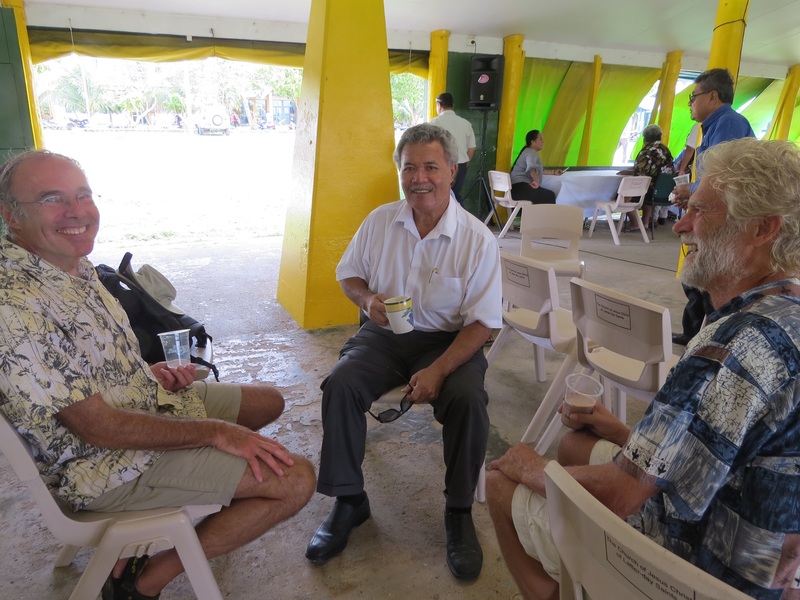 It is not charity for Tuvalu; it is a survival fund. I found this rather inspiring. Here is a man willing to stand up for what he believes is right, and ask the world to stand with him. I offered that raising awareness is the main thing we can do, and maybe we should make T-shirts with his “Save Tuvalu, save the world” motto. He liked that idea, though he quipped that the industrialized countries have scheduled the upcoming Paris climate change conference when it will be too cold for T-shirts…and when global warming will not be present in people’s experience. I found the entire event fascinating…and it leaves me face to face with a familiar personal dilemma. One the one hand, I like this place, and I like the people I have met, and I like what I have seen of their culture. If/when sea levels rise, and cyclones hit, this country is going to be destroyed — the people will become “climate change refugees,” and their culture will almost certainly be lost along with their homes. 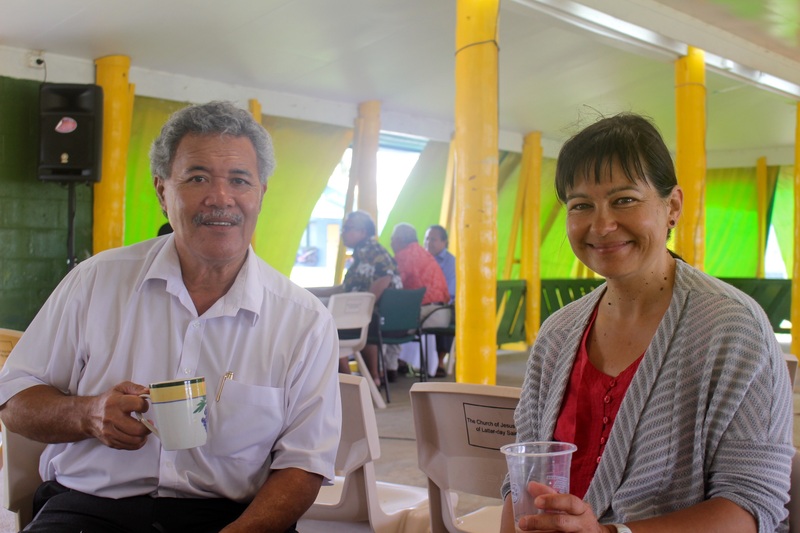 I would be proud to take a stand with Enele Sopoanga, PM of Tuvalu, demanding that all the countries of the world “do the right thing” in limiting climate change, and minimizing the effects. On the other hand, change happens. 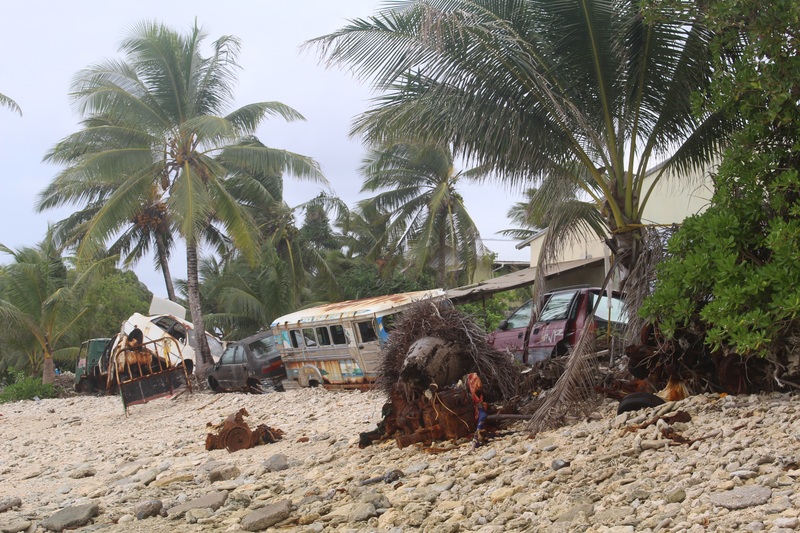 Forces are already in play that will impact Tuvalu and the world climate. I believe that mankind is generating some of these forces, and I believe there are “natural” (non-human) variations also at play. 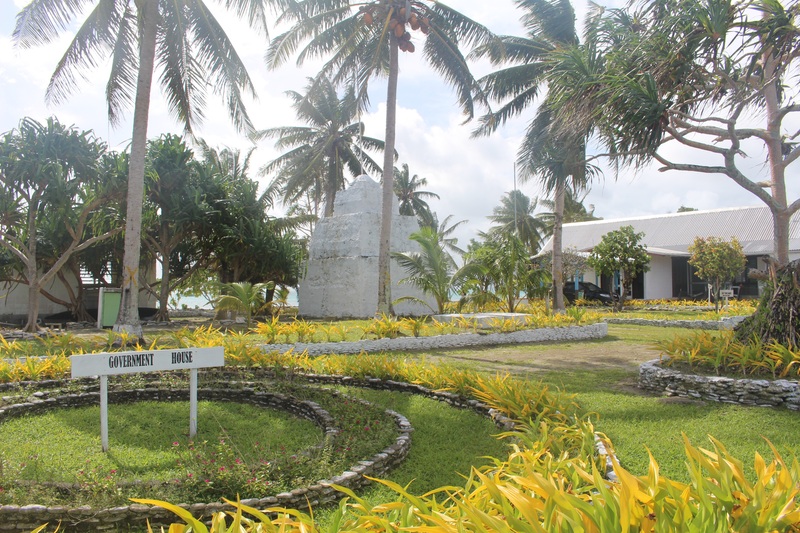 Is the “right thing” to try to preserve Tuvalu? 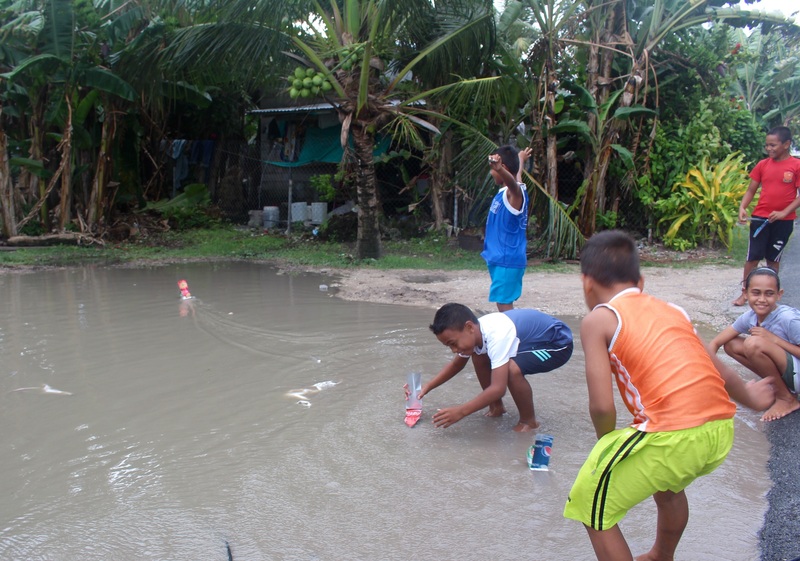 Or is it to help the Tuvaluans adapt to the coming changes? Either way, here I am trying to raise awareness. 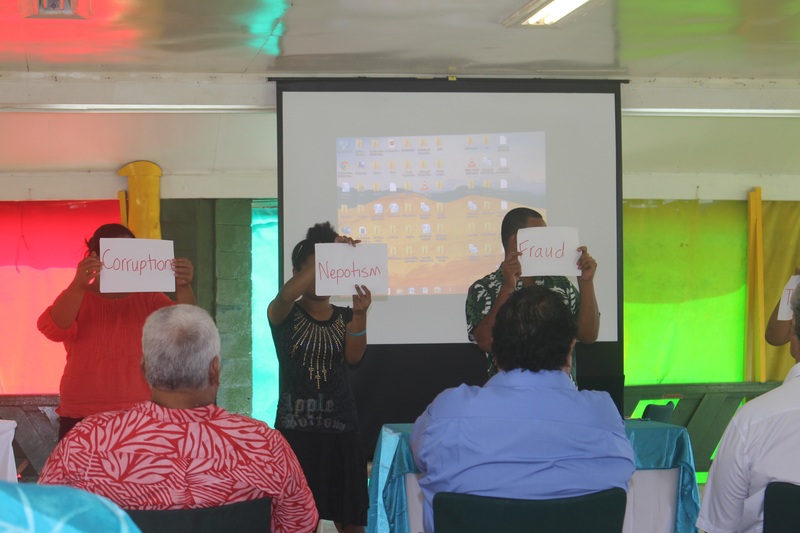 Now you know a bit about nine South Pacific atolls and reefs called Tuvalu. 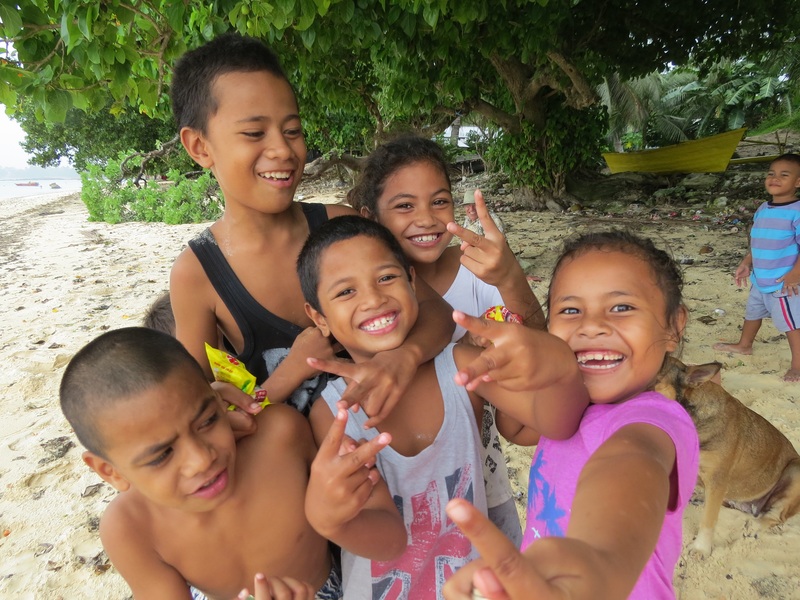 I would be delighted to read your comments — what you think is “the right thing” about Tuvalu, about climate change, about related policies of industrialized and developing countries, about renewable energy sources, and about what actions an individual can/should take. Or, like me, what questions you have that leave you uncertain about what to think and what to do.